Hi there! I’m Kimberly, the owner and content creator at Stuffed Suitcase. On my blog I share tips and ideas about family travel and life between trips. Building family memories, especially while traveling, is one of my favorite hobbies. I’m happy to be sharing this Mother’s Day Photo Breakfast Tray here with Maggie and The Love Nerds readers! If you’re a mom reading this, perhaps you can print the post for your husband or partner as a hint for a mother’s day gift idea. Or you could make this for your own mother with some photos from your childhood. The great thing about this tray is it’s versatility. It could be used as a photo display on the wall or bookshelf, for remotes or magazines on a coffee table, or even a jewelry tray for a dresser. The first step for this project is getting the frame. I chose an 11′”x 17″ frame so the dishes would fit on the tray. Next I bought some cabinet door pulls from Home Depot that I felt matched the feel of the frame. Think about the feel you want for the piece. Drill into the frame to attach the cabinet door pulls. I decided to have the handles as far to the edge as possible for the easiest carrying position. I also liked how these door pulls had a slight curve, which looked great as tray handles. I then removed the hanging hardware that was attached to the back of the frame. One note, you might want to add some felt to the back/bottom of the frame, because the screws for the handles left a small scratch on our table. Find some fabric or large paper and cut it to fit. Tip, I used the paper that comes in the frame as my template for the fabric size. Then print your photos; you can place them on a cardstock mat if you want. I now wish I would have printed the photos in sepia or black and white, so keep those options in mind. The ‘I ♥ MOM’ was made on picmonkey. Tape your photos onto the fabric so they won’t slide, then put your frame back together. And there you have it. A great Mother’s Day Photo Breakfast Tray gift that looks great even after eating breakfast in bed with your favorite people. Being served breakfast in bed by my girls is one of my favorite ways to celebrate Mother’s Day! Do you have any special Mother’s Day traditions? Thank you to Maggie for letting me be a guest! If you’re looking for more fun ideas and family travel tips, check out Stuffed Suitcase and follow me on facebook, pinterest, google+, and instagram. Happy Mother’s Day! Where did you get the frame? Now THIS is an awesome gift idea for any mom! What a great gift idea! I love it and can see using this for every meal. !Such a darling photo tray! Love it! What a great Mother’s Day gift! I love how it is two gift in one. And it seems pretty easy to make. Wow! This is different! Definitely something I never would have thought to do! This is a very cute and fun craft. I love it! Pretty & practical…this is a WIN! That is so sweet! Years ago I made something similar for my mother-in-law with just a glass frame, but I love the addition of cabinet hardware. Such a great idea! I absolutely love this idea! What a great inexpensive Mother’s Day gift! Thank you for sharing. That is a cute and creative idea. I love it. That is such a cute idea! I can’t wait to make one like it. One of the cutest ideas I’ve seen in a while. I really love how that came out. This is such a cute decor piece. I love the look of the frame! G’day! What a great idea for Mother’s Day! what a sweet idea, it’s so versatile too! 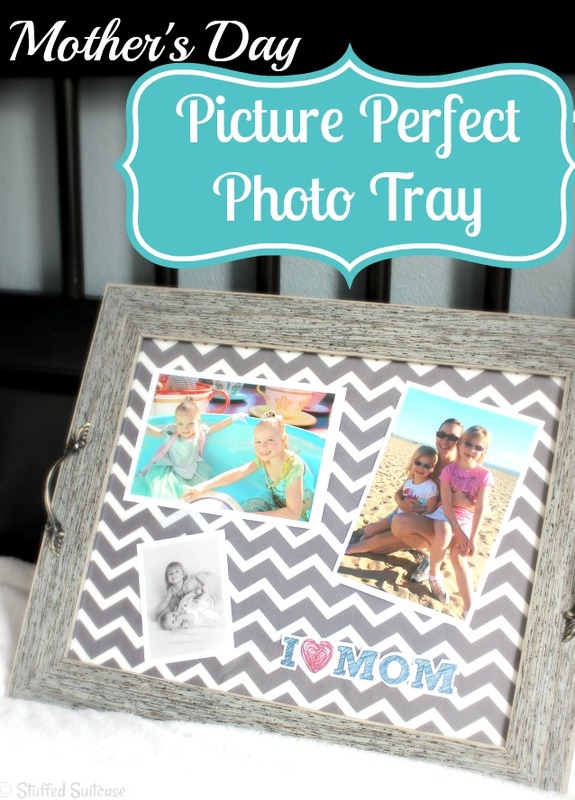 That photo tray is so awesome and does make such a great gift idea! That came out great. I wish I was handy. What a fun gift! I love how it turned out. Love that! thinking about making something like that and shipping to my mom! Such a great idea for a mother’s day DIY, thanks for sharing I think I’ll make one for my self. I love that so much! I love gifts that incorporate family photos! This is so cute! I’m sure any mom would love to get this for Mother’s Day. I would have a hard time using one because I would be fearful of wrecking it! That is almost too cute to use. This is so cute! I bet any mom would love to see this on Mother’s Day morning!